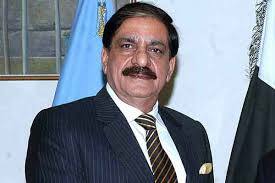 ISLAMABAD: National Security Adviser (NSA) Lt General (r) Nasser Khan Janjua has reiterated that Pakistan is determined to defeat the menace of terrorism for a bright future. He said this while talking to Romanian Ambassador Nicolaie Goia, who called on him in Islamabad on Friday. “Participation of Romania in this connectivity will also bring Pakistan and Romania closer to each other,” he added. The NSA briefed the ambassador on regional security situation with particular reference to Afghanistan and reiterated that Pakistan and its people were determined to defeat the menace of terrorism to embrace a brighter future. NSA Janjua warmly received the guest and said that Romania is a great country with rich history. “Pakistan attaches great importance to its relations with Romania and considers it as an important member of the European Union,” he added. Discussing the regional security environment, the envoy applauded Pakistan’s efforts for regional peace and stability. “We understand that Pakistan is caught in a complex security situation and is facing multidimensional challenges,” he commented. Besides promotion of bilateral relations, matters pertaining to the regional security situation and regional connectivity also came under discussion. The ambassador traced the history of Pakistan Romania relations and said that ever since the establishment of diplomatic relations in 1964, both the nations have come close to each other. “Romania considers Pakistan as a credible and responsible country and supports it at every international forum, including GSP Plus status which has increased Pakistan’s exports to the EU by more than 30 per cent,” he said. “In addition, both the countries share the commonality of opinion on regional and international issues. The two countries have longstanding cooperation in political, economic, defence and cultural fields, and people to people contact. We, however, need to increase our trade and strengthen the economic dimension of our relationship,” he added.